Nonsense Factory on taiteilijan luoma surrealistinen kertomus kuvitteellisesta tehtaasta. Tila koostuu kuudesta huoneesta: Central Image Box Control Room, Welfare Policy Making Room, Coupon Room, Artists’ Room, Factory Basement ja Blue Print Room for Future Factory. Jokainen huone vastaavasti esittää vertauskuvallisesti eri teemoja aikamme monimutkaisessa yhteiskunnassa: kuvakontrollia, onnellisuutta ideologiana, kapitalismia ja rahataloutta, kulttuurisnobismia, idealististen arvojen epävakautta sekä jatkuvaa kilpailua, joka on väistämätöntä kasvuun tähtäävässä yhteiskunnassa. Tämän pohjalta Nonsense Factory muodostuu eri esittämisen tavoista kuten videosta, valokuvasta, piirroksesta, neonvaloista ja veistoksesta. Porin taidemuseolla esitettävä teos ottaa aiheensa Nonsense Factoryn Central Image Box Control Room –osuudesta. Se esittää mestareita ja heidän ammattitaitoaan, osaamistaan, ajatuksiaan ja ongelmiaan nykypäivän elämästä. Se nostaa kysymyksiä työn ja luovuuden arvosta, toimii kuin punnus tasapainottaen yhteiskunnan painopistettä epävakaana aikana. Työn kautta taiteilija haluaa kutsua yleisön ajattelemaan, miten on mahdollista muuttaa todellisuutta. Nonsense Factory is a surrealistic narrative written by the artist, which depicts a fictional space of the ‘factory.’ The space is composed of six rooms: Central Image Box Control Room; Welfare Policy Making Room; Coupon Room; Artists’ Room; Factory Basement; and Blue Print Room for Future Factory. Each room respectively represents the following issues in the complex society of our time in a metaphorical manner: the issue of controlled images; happiness as ideology; capitalism and the monetary economy, the cultural snobbery; the failure of idealistic values; and the infinite competition inherent in the pursuit of constant growth. Based on this story, Nonsense Factory consists of complex media such as video, photography, drawing, neon light, and sculpture. The work presented here takes its motif from the ‘Central Image Box Control Room’ and shows masters and their craftsmanship, their skills and thoughts and issues of contemporary life. It raises questions about the value of labor and creativity, which function as the weight that balances the center of gravity in the society in the age of uncertainty. Through the work, the artist wants to invite audiences to think about how to find the potential to change reality. 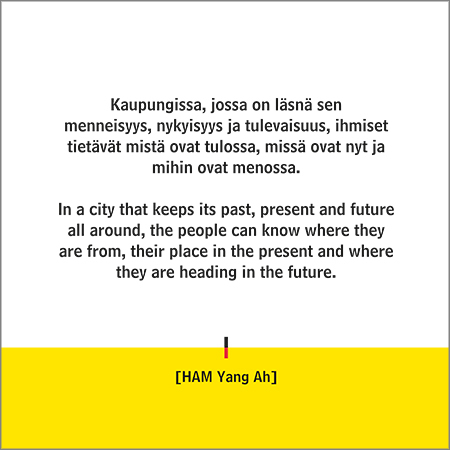 HAM Yang Ah (s. 1968, Soul) on kansainvälisesti tunnettu jopa vuosia kestävistä videoprojekteistaan. Liikkuessaan todellisuuden, unien ja fiktion välillä, Hamin työt paljastavat nyky-yhteiskunnan absurdiuden. Ham muutti New Yorkiin päätettyään opintonsa Soulissa. Vuonna 1998 hän valmistui maisteriksi New Yorkin yliopiston mediataiteen laitokselta. Vuosina 2006-2007 Ham sai residenssin Amsterdamista (Rijksakademie voor beeldende kunsten) ja vuonna 2010 Istanbulista (Platform Garanti Contemporary Art Center). Nykyisin hän asuu ja työskentelee Soulissa ja Amsterdamissa. Vuonna 2013 Ham valittiin Nonsense Factory –teoksella vuoden taiteilijaksi Soulissa (National Museum of Modern and Contemporary Art). HAM Yang Ah (b. 1968, Seoul) is internationally acknowledged for her video projects which can continue for years. By oscillating between the reality, dreams and fictions, her works reveal the absurdness of contemporary society. After her studies in Seoul, Ham moved to New York. In 1998, she received another MA in Media Art from New York University. For 2006-07, Ham won a residency at the Rijksakademie voor beeldende kunsten in Amsterdam and for 2010 at the Platform Garanti contemporary Art Center in Istanbul. Currently, she lives and works in Seoul and in Amsterdam. In 2013, Ham was nominated for Artist of the year by the National Museum of Modern and Contemporary Art (Seoul) with The Nonsense Factory. Recently, her video works have been exhibited, among others, in Discordant Harmony (2015), in ArtSonje Center, Seoul, Cold War, Hot Peace (2015), Slought Foundation, Philadelphia, and in The Future is now (2015), Le Musee d’Art Contemporain de Marseille.